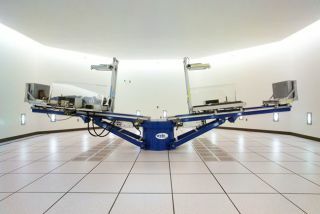 A view of a NASA-provided Short Radius Centrifuge at UTMB in Galveston is reminiscent of similar equipment from 40 years ago when astronauts were training for the initial giant leap to the Moon. New plans for artificial gravity tests in space usingcentrifuges may hold the key to helping future astronauts ward off thedebilitating loss of muscle and bone due to weightlessness on long missions toasteroids or the moon under NASA's revised space exploration plan. The newNASA budget proposed by President Obama not only setssights on long-duration missions, but also extends the lifetime of theInternational Space Station. Upgrades for the space station "could includea centrifuge to support research into human physiology," according to a summaryby the Office of Management and Budget. Space station residents currently rely upon differentexercises to keep themselves fit for the eventual return to Earth.But a spinning centrifuge device could create artificial gravity, whichsimulates the gravitational tug a planet, like Earth, has. The giant spinningdevice will give astronauts a healthy break from the weightlessness of space. "You can try to treat each of the effects ofweightlessness system by system, with certain pills for bone loss and certainexercise regimens for the muscles," said Laurence Young, an aeronauticsand astronautics engineer at MIT in Cambridge, Mass. "Or you can treat theroot cause of weightlessness by restoring gravity." NASA's earlier focus on sending astronauts back to themoon meant shorter-duration spaceflight and less urgency to develop artificialgravity. The U.S. space agency focused on traditional countermeasures, such as modifyingsquats or other exercises to counteract bone and muscle loss, according toJustin Kaderka, an artificial gravity researcher working with Young at MIT. Now the prospect of longer missions to more distantdestinations has once again raised the appeal, if not necessity, of artificialgravity. One of Young's Japanese colleagues filed a proposal withthe Japan Aerospace Exploration Agency months ago to launch a human centrifugeto the International Space Station. The device could ideally take up thediameter of a space station module with a radius as wide as 6.6 feet (2meters). Astronauts would lie down on or strap themselves to oneend of the centrifuge arm or frame, and experience artificial gravity while thedevice spins. A rider could also provide the human power to spin the centrifugeby pedaling bicycle-style. "If you have two arms that'd work nicely,"Kaderka told SPACE.com. "Cycling would give an aerobic workout, andthe other person not cycling could do resistance exercises like squats orpresses." The riders on a two-arm centrifuge could then switch offon exercises and on powering the device. A vibration isolator would absorb anyresidual vibrations that might otherwise disturb the rest of the space station,according to the proposal. Earth experiments suggest that artificial gravity worksjust as well as traditional countermeasures to prevent long-term weightlessnessfrom affecting human cardiovascular health, Kaderka said. He drew thatconclusion after reviewing 75 experiments done over the past 40 years, as hisMIT master's thesis. But Kaderka also found that more research is needed toassess whether artificial gravity can work its wonders upon muscle and bone.That's partly because researchers must resort to expensive, long-term bed-reststudies to really see the effectson muscle and bone. One human centrifuge did go into space with the STS-90"Neurolab" mission aboard the space shuttle Columbia in 1998. But theastronauts spent barely an hour in total testing out the centrifuge during the16-day mission, which still left the effectiveness of artificial gravity opento question. "It'd be amazing to get hard data on how artificialgravity is an effective countermeasure in space," Kadera said. Artificial gravity research has suffered in the latterhalf of the past decade because of NASA's budget issues and earlier focus onreturning astronauts to the moon. No funded centrifuge studies on human physiologycurrently exist in the United States or among most of its international spacepartners, Kaderka noted. NASA shut down its artificial gravity studies at the Johnson Space Center in Houston several years ago ? a decision that resulted in much lost momentumfor researchers, according to Young. But both he and Kaderka seemed optimisticthat the space agency's new direction would lead to resurgence in artificialgravity work. Getting a centrifuge up to the space station would domuch more than help answer the question of artificial gravity's effectivenessin space, or putting renewed interest in complementary Earth experiments. Itwould also allow researchers to start fine-tuning the exact conditions neededto for artificial gravity to work. "One of the hopes is to have the [centrifuge] protocoldown to within an hour or so of being spun, because that's roughly how much theastronauts spend doing exercise," Kaderka explained. Other questions include debate over how fast should thecentrifuge spin, setting the ideal artificial gravity level, as well as howmuch time astronauts will need to spend aboard the centrifuge to see itsbenefits. Then there are also biomedical questions about whether astronautsencounter problems with dizzinessor vertigo, and whether the centrifuge is both effective andenjoyable. Of course, researchers can begin tackling some of thosequestions if they can get renewed NASA funding for Earth experiments as well.Otherwise they could be in for a long wait until they see a centrifuge launchto the space station. "Hopefully we won't have to wait as long as havingdata come back from a space station centrifuge," Kaderka said.